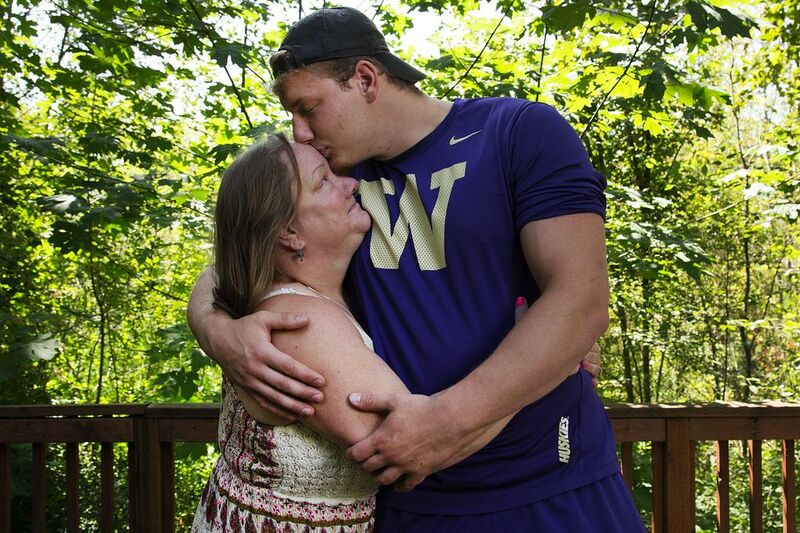 UW offensive lineman Kaleb McGary has had to overcome plenty in his life. He’s endured three heart procedures while trying to fulfill a can’t-miss football potential, a potential he hopes will rectify his family’s struggles. His heart was beating 300 times a minute, his head spinning, his legs giving out from under him. Then, of all things, it was his nose that bore the brunt of the initial shock. 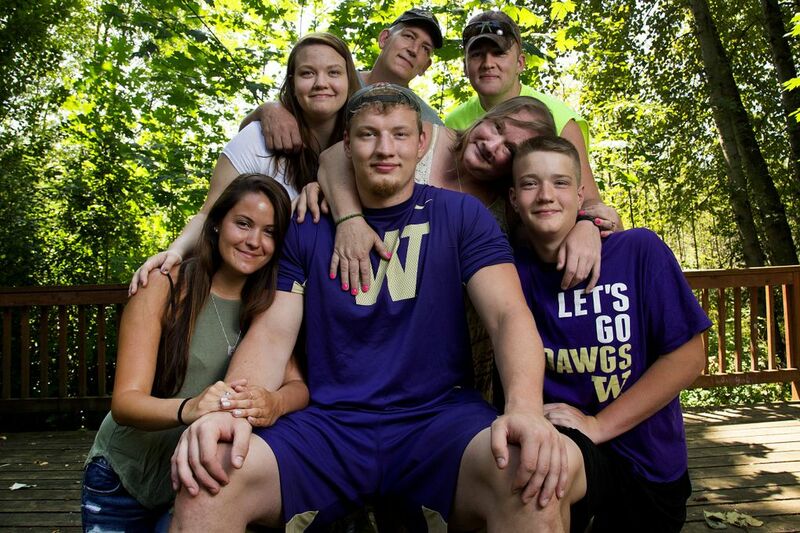 UW football player Kaleb McGary can chuckle a bit now about the time his heart arrhythmia caused him to lose consciousness while playing in a basketball game at Fife High School. During a fourth-quarter timeout of a taut game against rival White River in January 2013, he collapsed face-first into the bottom row of wooden bleachers. He came to moments later with blood running down his face. What remains from that initial scare is a scar spanning the bridge of Kaleb’s nose. Before becoming one of the state’s most sought-after high school football recruits, and before resuming his bid for a starting job on Washington’s offensive line this month, Kaleb and his family first had to figure out what was wrong with his heart. After collapsing in the Fife gym, he was rushed to the emergency room at Tacoma’s St. Joseph Medical Center; en route, paramedics discovered Kaleb’s quivering heart was beating 300 times a minute. That night, a doctor suggested to Kaleb’s father, Justin, immediate surgery to replace a valve in the teenager’s heart. Justin quickly nixed that idea, just as Kaleb’s mother, Cassandra, refused to accept the assertion from one of the first cardiologists they visited that her son would never be able to play football again. She wanted more tests, more answers; it took more than three years, but Kaleb has, finally, found some stability with his heartbeat. The family’s resolve, after all, had already been tested. About a year and a half before Kaleb’s collapse, Justin was found to have multiple sclerosis, an ongoing battle he refuses to let slow him down. A year after that diagnosis, the McGarys lost their home and their family farm. Ever since, even as he’s endured three heart procedures while trying to fulfill the can’t-miss football potential many placed on his massive shoulders, Kaleb has been making plans to make things right again for his family. Situated on 5.75 acres in the remote southern Washington outpost of Amboy (population: 1,608), about 30 miles northeast of Vancouver, the McGary family home was 4,400 square feet of blissful craziness. There were five bedrooms, six bathrooms, three fireplaces and two goats that felt most comfortable in the kitchen. And if that wasn’t enough space for Justin and Cassandra’s three children, there were 77 acres of federal land next to their property, where Kaleb, the oldest, discovered his love of the outdoors. He hunted and fished and made sure to feed the chickens and the hogs in the morning before walking to the school bus stop. By his side, always, was Teton, a Border Collie-Australian Shepherd mix and Kaleb’s closest ally since the boy was in diapers. Inseparable, those two. Have you seen what a drove of pigs can do to a watermelon? Dude, you’ve got to see it sometime, he said. It’s a treat. From his Amboy oasis to the swirling uncertainty of a new life 140 miles north in Fife, circumstances changed dramatically for Kaleb and his family in the summer of 2012. The economic recession had meant fewer work days for Justin, a union longshoreman based out of the port of Vancouver, and as the unpaid bills piled up Cassandra said she spent several years trying to refinance their mortgage. They hired litigators and filed — and re-filed — bundles upon bundles of paperwork to their mortgage company. Eventually, their refinancing plea was rejected, the final blow in their efforts to keep their home. The couple had burned through their savings trying to save the farm — and pay their skyrocketing medical insurance premiums — and couldn’t afford to pay the tens of thousands of dollars in backlogged mortgage payments. “The kids were heartbroken,” Cassandra said. The family’s only real choice, she said, was to move back to Fife — where she had met Justin when they were in high school — and live at her childhood home. That presented a new set of problems. Cassandra’s mother had recently died, and her father was moved into a nursing-care home. They left behind a house so rundown, so overflowing “with crap” — exploding food cans, floor-to-ceiling piles of junk, Cassandra said — that it was unlivable. So the McGarys parked their RV on one side of the driveway and lived in that. They then cleaned up Cassandra’s parents’ RV so Kaleb and his two younger siblings could sleep in it. The McGary Mobile Park, they playfully dubbed their new homestead. At least they kept their sense of humor. Most of the farm animals stayed back in Amboy. Cassandra was able to find homes for the donkey and the goats and cats and chickens. Most of the pigs were raised to be butchered anyway. Teton, old and ill but forever loved, was laid to rest on the farm. With one shot from his .22 long rifle, Kaleb said goodbye to Teton. “I wasn’t going to let anyone else do it,” he says. He looks down, then pauses. The doctors at UW’s Center for Sports Cardiology had to order special electrode catheters — extra long — for Kaleb’s most recent heart procedure, performed in January. They’d never done a cardiac ablation procedure on someone so large. It’s considered a minimally invasive procedure. The catheters used to repair Kaleb’s heart arrhythmia — a condition called atrial fibrillation (AFib, for short) — were inserted through a cut in Kaleb’s groin, navigated up through a blood vessel in his torso and into a pulmonary vein in his heart. In most procedures, the affected area of the heart is, in effect, burned (or sometimes frozen) to contain the misfiring pulses that cause the irregular beats. The procedure typically takes at least four hours, and this latest one was the third such procedure done on Kaleb’s heart. He hopes it is his last. His symptoms have improved dramatically. Rarely, and randomly, the irregular beats resurface, but much less frequently than before January’s procedure. The episodes have always been sporadic: he seemed just as likely to get one sitting in a classroom as he was working out or playing football. One day this summer, he ran the upper stairs in Husky Stadium’s north bleachers with teammates, an exhaustive team conditioning test. A couple hours later, during a 75-minute interview on campus, he said he was feeling great — no issues at all. 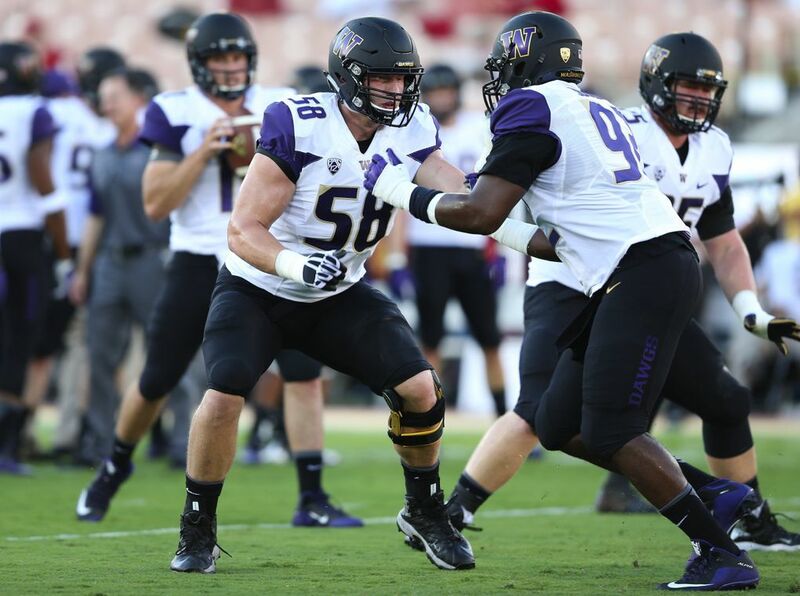 That’s been the norm of late, and as the start of Huskies fall camp approached earlier this month, the redshirt sophomore right tackle was eager and optimistic about the opportunity to play uninhibited. 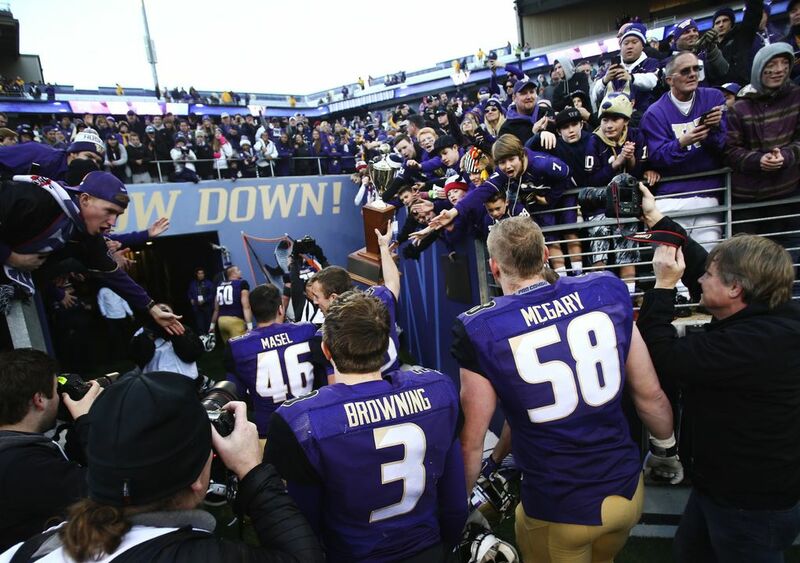 UW’s doctors and trainers are also optimistic he will have that opportunity, even as the only football player with AFib issues to come through UW in Dr. Kimberly Harmon’s 18 years as the team’s head physician. She said he’s been “thoroughly” evaluated by the specialists at the sports cardiology center, and he goes through regular checkups. “Above and beyond what we put the other kids through,” she said. When the episodes intensified for Kaleb two years ago, soon after arriving on campus as a freshman, he was treated with medication. He hated that. Made him feel like a “walking pharmacy.” The side effects at times felt worse than the worst heart beats: chronic stomach aches and headaches; constipation one day, diarrhea the next. “Just frickin’ awful, man. I was miserable,” he said. That’s when they turned to the albation procedures and — “knock on wood,” Harmon said — the latest results have been promising. McGary reported to camp measuring 6-8 and 308 pounds. A few days earlier, his shirt off, he was showing off the muscles in his chiseled abs. He’s He-Man with a crew cut. There are times when Kaleb still feels like a fish out of water near the tall buildings and congested traffic in and around UW’s campus. “Too much concrete for him,” his mother said. Walking around campus, he occasionally will wear the Stetson beaver-fur cowboy hat his dad gave him; lately, he prefers his new Stetson buffalo hat he bought last December in Texas during UW’s week in Dallas for their bowl game. Kaleb was back in Fife visiting his family earlier this month, and brought his girlfriend, Brianna Shannon, with him from UW. His parents were there, and so was his sister, Savannah, 18, and brother, Jonah, 14. His best friend from Amboy, Jacob Walker — a fixture around the farm back in the day — was also visiting. It took a team of world-class cardiologists to mend parts of Kaleb’s broken heart. With support from this tight-knit circle of family and friends, he’s started to put other pieces of himself back together. The McGarys live on the last lot of a dead-end street only a two-minute drive from Fife’s bustling casino. The house is slowly getting cleaned up, and the family has two pet ferrets, “eight billion” (give or take) cats, Justin estimates, and a squirrel that seems most comfortable indoors (much to Justin’s chagrin). They also rescued a sweet but skittish Australian Shepherd and named him Coda. Across the street is massive green overgrowth, part of a nature reserve surrounding the Hylebos Creek Off-Channel. Just a quarter-mile away from the house is a peaceful walking trail over the creek, a perfect locale for a family photo shoot. No, not everything is perfect here: Justin’s fight with MS continues, but he still supports the family working on the ports, often having to make the two-hour commute to Vancouver. The cleanup around Cassandra’s parents’ house is ongoing, but she says the last thing she wants is anyone to feel sorry for them. Kaleb has plans and, even after everything, he has perspective. “… Life maybe won’t be easy, but I can certainly make a difference,” he said. “Dad can finally stop worrying about making ends meet week to week; Mom can finally stop worrying about what problems the RV has now, or how we’re going to make this or that; my brother and sister will finally get to live in a house again. It’s really been a long road to hoe, but getting this far I’m finally starting to see speckles of light, man. It’s a good dream and, finally, a good time to dream again.